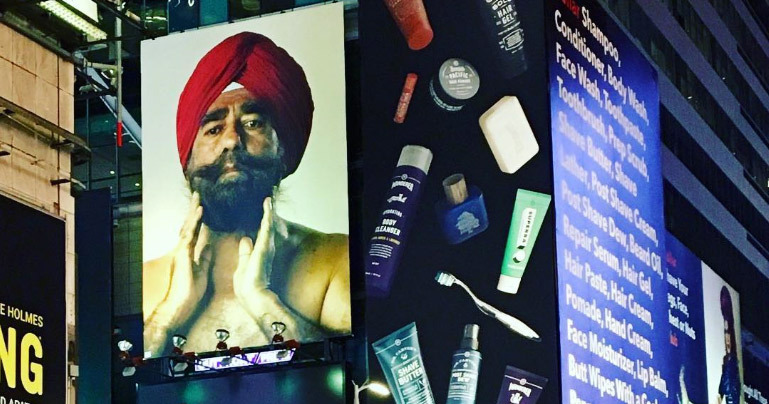 If you look up from Times Square you just might catch a turbaned Sikh man in an ad for a shaving company. But there's no need for alarm. The caption reads: "Beard Oil. Because for some people beards are a religion." 74-year old Pritam Singh has just become the unlikely face for Dollar Shave Club's new ad. His face now adorns New York's most famous billboard spot. Mr Singh is not widely known. He has had minor acting roles in Hancock (2008), Sleeper Cell (2005) and In the Wild (1992). IMDB lists him as a composer too. He even had a cameo role in Naked Gun! "My dad and I worked together on a beard oil commercial :) Here’s my DAD in a massive ad for beard oil in Manhattan, New York!!! That’s how we do!!!" The ad also caught the attention of Brown Girl Magazine, where contributor Jashima Wadehra wrote: "Having a Sikh man to promote their beard oil, a turban donning gentleman graces Times Square and ultimately encourages embracing our differences." "As a woman raised in the Sikh faith, it warms my heart to see advertising efforts to represent different faiths, races and cultures." Pritam Singh came to the US in 1983 from the city of Patiala in Punjab, according to American Bazaar Online. He says he tried his hand at acting to improve the meagre representation of Sikhs in American media. His son Amandeep Singh said: "Only 30% of Americans know what Sikhs are. The rest think that we are Hindus or Muslims. So, we are pushing for education of who Sikhs are. The Dollar Shave Club is an important milestone and I hope millions seeing it recognize our presence." If the ad is seen as successful, Dollar Shave Club plans to take it around the country.